Question: Where is the one place where you won’t find Indians? By this definition or by any other definition, Maine qualifies as “ heaven ” on earth. Seejo and I along made a 4 day trip along with my mother to Maine in the last weekend of September. The agenda was to relax, view the fall colors and see the beautiful Atlantic coastline and sample the famous Maine lobsters. A little geography about Maine : Maine is the north eastern most state of the United States , bordered by the Atlantic Ocean on the east and south. With a population of a little more than a million people, it is one of least densely populated state in United States . Maine ’s population is concentrated around the southern cities of Portland , Bangor and Augusta , most of northern Maine is still largely unpopulated forest land. The popular tourist attraction in Maine is the Acadia National Park , with its view of the rugged coastline dotted with tiny island, mountains, ponds and even a fjord. Acadia is primarily an island located on southeast corner of Maine , and is the only national Park in the north eastern United States . As we drove up to Acadia National Park from New Hampshire airport, the trees on either side ofthe road were just turning colors from a solid green to reds, yellows and purples. Before heading to our first destination, the Bass Harbor lighthouse we drove around the Southwest Harbor area, enjoying the beauty of blue skies reflected in even bluer waters of the inland lakes, framed by the colorful fall landscape. We had an impromptu picnic lunch on the banks of the echo Lake , with nobody other than some sea-gulls and the picture-postcard scenery for company. We did stop briefly at Somes Sound , supposedly the only fjord in United states, I was really eager to actually see how the glaciers have carved the land into little crinkly folds but was in for a disappointment, this was no delicate folds but appeared like a sort of small bay. Definitely not something I would give a prize for, perhaps the guy who did Norway performed better than this!! The Bass-Harbor light house also did its part in being contrary to my expectations. Lighthouses in my imagination were tall majestic structures standing precariously on islands with huge waves lashing the doorsteps. 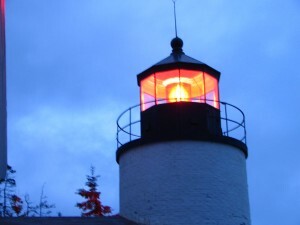 The Bass harbor light head with its red blinking head light was actually sort of short and stout and quite easy to reach! The easy access to it was perhaps the reason that it is supposedly the most photographed lighthouse in United States . Seejo did his part in making sure that it maintained its numero uno position by clicking several photographs. Early next morning we set off to the Cadillac Mountain within Acadia National Park to enjoy the sunrise so that Seejo could indulge in some early morning photography. The Cadillac mountain is made up of pink granite rocks and is tallest mountain in the Eastern United States and consequently the first point to get the sun-rays in United states . Covered in gloves, caps, mufflers, sweaters and coats we braved the sub-zero temperatures in an effort to see the sunrise, unfortunately, the early morning mist obscured our view and we could barely see less than a meter ahead. The day was spent in exploring Acadia National Park., driving along the Park loop road, & stopping at the various points of interest such as Sands beach (the only sandy beach in Acadia), the Otter Cliff & Cove (incredible views of the Atlantic ocean) and the Thunder hole (so called because of the noise that is caused when the incoming wave pushes the water out of a rocky inlet is like a thunder clap). 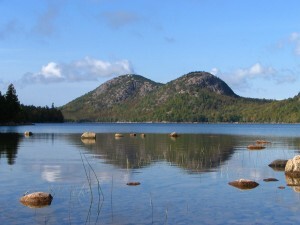 We had lunch watching the reflection of the two rounded peaks of the Bubble Mountains in the still blue waters of the Jordan Pond. We headed out again to the Cadillac Mountain to try our luck again at seeing the view on the top of the mountain. Luck did not favor us this time either, the winding way up was certainly beautiful with a spectacular sea view on either side but on the top the view was limited due to a dense layer of fog. We were already halfway down when we saw the fog clearing, we made a mad dash back to the top of the mountain. It was well worth the effort. Three times proved a charm, from the top of the pink granite mountain top, we could see the ocean all around us. On one side several tiny islands dotted the landscape, almost as though someone had carefully placed inverted coconut shells into water which was colored bright blue. Puffy clouds floated below us almost providing a personal shade to each of these tiny islands and miniature boats were playing hide and seek amongst the islands. The view from the other side of the mountain was just as breathtaking, the mists were swirling gracefully providing tantalizing glimpses of the mountainside just turning into a riot of fall colors and sloping gently towards the blue waters of the Atlantic ocean . Patting ourselves on the back for our perseverance, we headed off to a magnificent lobster dinner. Lobster soup, lobster salad and lobster pasta formed Seejo’s and my dinner while Amma painfully chewed on some plain pasta in tomato sauce. We set off to our bed & breakfast inn at the Schoodic Peninsula for the night and the next day. Oceanside Inn owned by a second generation Tamilian and her husband was a beautiful inn near the beach. Although quite expensive, it had beautiful scenery around the inn and wonderful vegetarian breakfasts (have you had melon soup garnished with edible flowers? , it tasted loads better than it sounds, I promise) which sort of made up for the exorbitant cost. The next day was unfortunately rainy but we had promised ourselves that we would take it easy. I spent a good part of the morning sitting on the porch listening to the sea waves breaking over the island reading a good old fashioned romance and smelling the wonderful smell that is present when the rain hits wet soil. As the rain cleared, Seejo spent some time, taking some wonderful photographs of the fresh scenery and flowers that surrounded the inn. The day was spent lazily, we visited some local artisans that created some beautiful dishes, purchased some of them as souvenirs, went wine tasting at a local winery with decent fruit wines, and went inland searching for the beautiful fall colors that give New England its fame. A tiny pathway off the main road was suggested to us by our hosts as the spot that had peak fall colors. We feasted our eyes on red, pink, yellow & purple leaves : a truly incredible sight which made Amma’s first fall experience an unforgettable one. We rounded off the day in style by watching the sunset off the Schoodic Point. The next day was our last day in Maine , we started off with a morning walk on the beach in front of our B&B. But then it was good bye as we started our drive to Boston . There were two important stops along the way. We decided not to take the inter-state main roads but drove along Route 1, the Atlantic coast across tiny picturesque towns on the sea, this was truly one of the most scenic drives that the United States has to offer. We made a brief but delightful stop at Camden Hills State Park . I was initially reluctant to stop here, after viewing the Atlantic for the past three days, at various times of the day, how different could yet another view point be. But I was to be proved absolutely wrong by the view from top of Mount . Megunticook, the highest point of the Camden Hills State Park . Words cannot do adequate justice to this panaromic view of the tiny coastal villages seen from the mountain. We sat for a long time, admiring the view till it was time to head south to Boston . Since we started the tour of Maine with a light-house it was only fitting that we end it up with one too this time the lighthouse at Portland , Maine . This light house was indeed tall & majestic, was painted pristine white and stood proudly on rocky ledge and redeemed my faith in light-houses. Framed by the sea and sky, it is an inspiring sight, no wonder that Longfellow who was a frequent visitor to this lighthouse, penned the poem “Lighthouse” using this as his muse. Truly a fitting scenery as the last glimpse of Maine . We headed off to Boston soon, we were invited for dinner at Seejo’s old school friends place. We had not seen an Indian face for the past 4 days, making it the only vacation spot that I had been to without seeing a single Indian around. We did make a quick stop-over in rainy Boston , where we quickly made up for the absence of Indians. But Boston is another story….